The Angono Round Up | Vespinoy! The boys from Angono, Rizal are going to be sponsoring a ride around their historic place on Saturday, July 14. Too bad I won’t be able to join because of a prior commitment. I was looking forward to this trip because Angono is such a treasure in our area (I grew up in the Rizal area too, in the now modern Marikina). Here’s a peek of what’s happening that day. Hep Hep.. Hooray! Hep Hep.. Hooray! 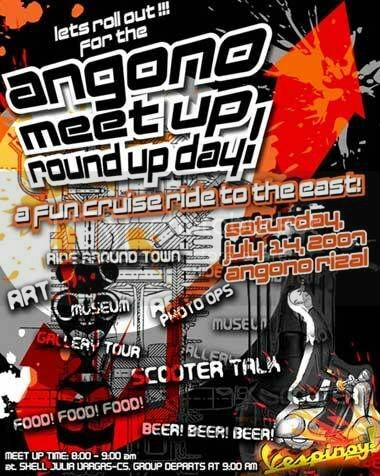 Its the Angono Meet Up – Round Up Day!!! Viewing of paintings and other artworks inside the artist’s studio and at the gallery. Viewing of paintings, sculptures, murals and other artworks inside the restaurant and at the Gallery. This is the art gallery of Totong Francisco, (passaggio) the grandson of Botong, some of his artworks are displayed here. Viewing of Blanco family paintings inside their gallery/museum. After all the gallery hopping, we will arrive here at The Haunted Kubo at approximately 12:00 noon, so dito tayo kakain ng lunch. Areglado na ang lunch natin dito (sagot na ng Angono boys). Kainan na!!! This is going to be a blast! Riding around the country’s capital of Art and visiting the various museums and getting treated for lunch to boot! Argh!! I am eagerly awaiting Part 2!! Click here for more details regarding the ride.